Yesterday afternoon, nine new bells were blessed by the Archbishop of Paris at the Cathédrale Notre Dame in the French capital. Eight of them during a ceremony at 11am, another bell called Marie, the centre-piece of the new bell installations, was consecrated during a religious service at 5pm and Luxembourg's very own Grand Duchess was the patroness of the Bourdon Marie. 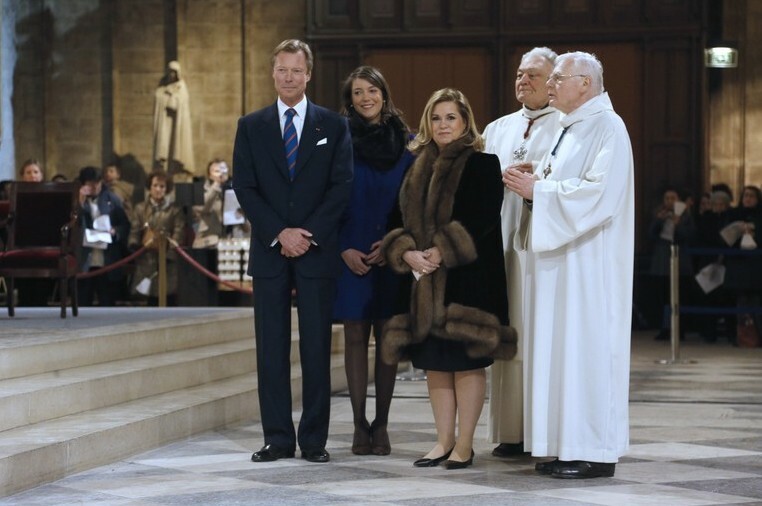 For the occassion Grand Duchess Maria Teresa was accompanied by the Grand Duke and their only daughter Princess Alexandra. All the bells that are now being restored on the occassion of the 850th anniversary of the cathedral were taken down, broken and melted in 1791 and 1792 during the French revolution. The great bell Marie, named in honour of the Virgin Mary, weighs six tons and was made in the Netherlands. More pictures can be found at AFP, a video at Wort. it's nice to see Alex and the Couple out and about. I would also like to commend you for the awesome job you are doing with keeping up with the family and to keep it up. Thanks a lot, it's always nice to hear that our work is appreciated!